Histogen’s focus is on the research, development, manufacturing and sale of products derived from the company’s core technology. Founded in 2007, Histogen develops naturally produced products that utilize the proteins and growth factors produced by newborn fibroblasts grown in a proprietary bioreactor that mimics the embryonic environment. Histogen has developed a rich product portfolio by using its proprietary tissue-engineering platform. The company creates products that offer unique commercialization opportunities ranging from research tools to biological products in various segments of the biomedical industry. Histogen’s headquarters and research facility are located in San Diego. 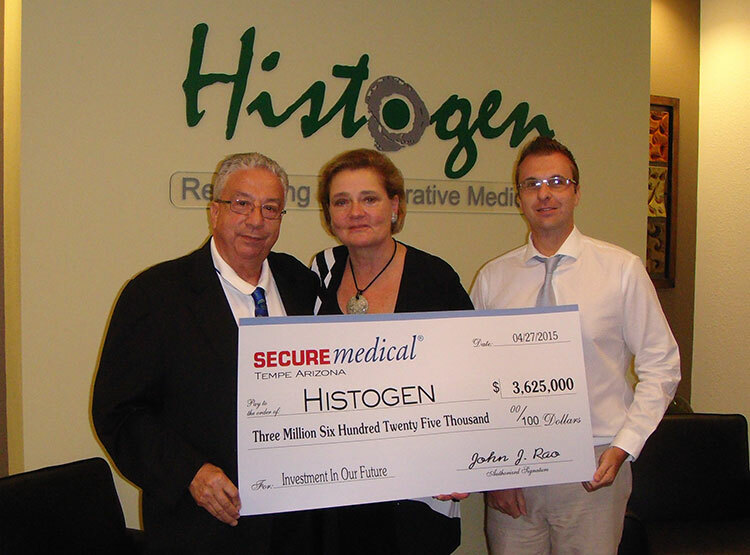 Secure Medical, Inc. (SMI) has been a loyal majority investor of Histogen, Inc. since 2008 when they funded $3,625,000 towards research and development. Supporting Histogen was an easy decision for John Rao, President and owner of SMI since 2001 and Kyle Rao COO. John noticed the advanced biotechnology led by Dr. Gail Naughton, Ph.D., CEO and Chairman of the Board who founded Histogen in 2007 to develop treatments using regenerative medicine. Dr. Naughton has spent more than 30 years in researching the tissue engineering process in which she holds more than 100 U.S. and foreign patents.